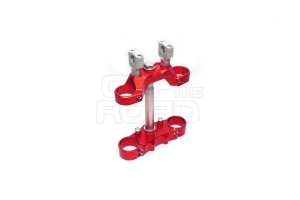 Here they are: the OTR triple clamps for WP USD front forks. 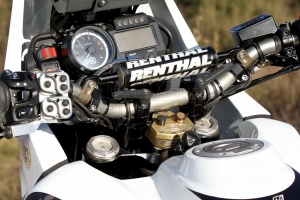 The OTR front fork kit for the Tenere was tested e.g. by Jenny Morgan on the Hero's Legend Rally 2009. CAD designed for best stiffness compared with lowest weight. CNC machine milled this clamps are made for the real off-road use! 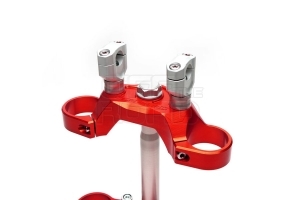 Upper clamp diameter is 54mm, the diameter on the lower clamp is 60mm. 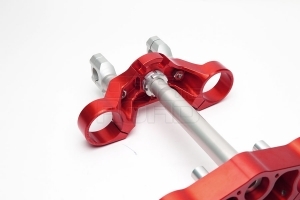 So you can use a lot of WP USD fork with 54/60mm outre diameter. The offset 25mm like standart, but this can be changed if you like. The upper clamps is machined with attachment for the steering lock. 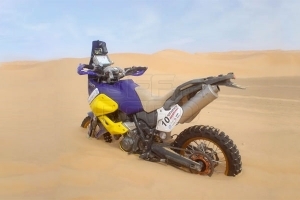 Also a high Rally front fender can be mounted. 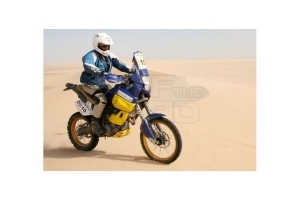 Fully CNC machined triple tree set for Yamaha XT660Z Tenere 2008 onwards. Avaiable in a flat or cranked version for use with shorter forks. So you can get the needed overall total length. The triple clamp is a masterpiece of high class german engineering. Great matching the unique look of your Yamaha. 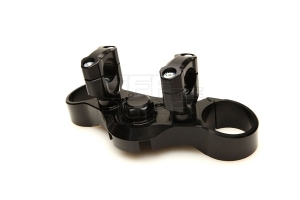 With it's fully compatibility of the steering lock mechanism this triple clamp increases the visual appeal of your bike. 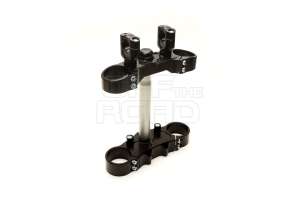 The stock steering nut can still be used. 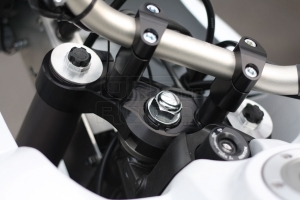 For our anodised aluminium steering nut see accessories below. 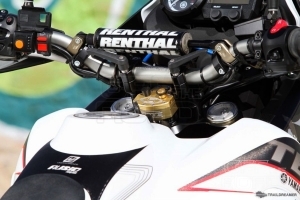 Fully CNC machined from solid Aircraft-Grade billet aluminum (7075 T6), our OTR triple clamp is much stronger than the stock Yamaha unit, but light in weight as well. Avaiable in black or silver anodised. Other colors on request. Scope of delivery: Upper triple clamp, Lower triple clamp, Steering head stem, 22 or 28mm handlebar clamps, Steel bolts, TÜV certificate. Custom after order - delivery time is about 2-3 weeks.